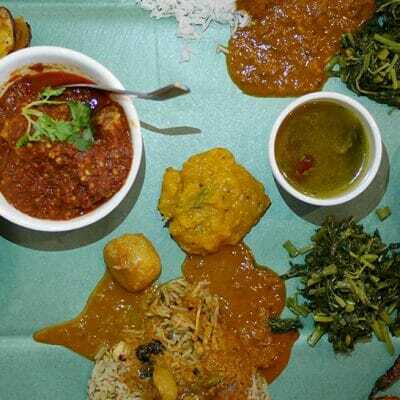 DISH at Dua Residency has been the talk of town. 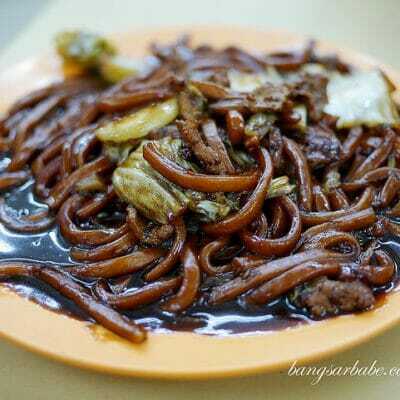 I’ve read about the restaurant on blogs, newspapers and food magazines…and all have nothing but praise for the food. Being the curious cat I am, I decided to check the lunch set out with ulric, a regular reader of mine. He wanted to try DISH too, so it was perfect timing. A 2-course set lunch at DISH cost RM65++ (starter + main course), and the 3-course set lunch is RM75++ (starter + main course + dessert + coffee/tea). Once seated, we were served with some freshly baked bread and eggplant fritters. The bread was adequately fluffy with a crusty exterior, while the eggplant was crisply fried and tender at the centre. 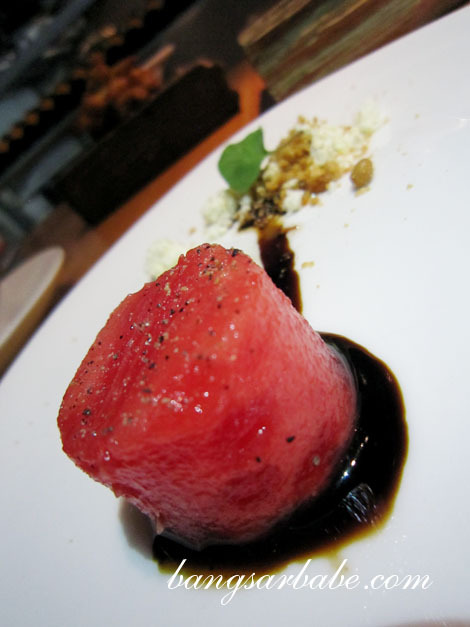 Our amuse bouche was a cube of watermelon with feta cheese and balsamic-chocolate reduction, which I found just alright. I ordered the braised mushroom and asparagus with fried egg on brioche and enjoyed it. 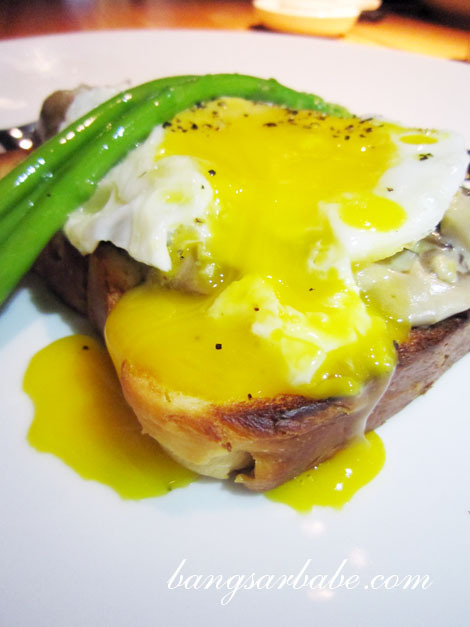 The still runny yolk went well with the crisp asparagus, tender mushroom slices and toasted bread. It’s hard to go wrong with this combination. rif ordered the unusual – white onion soup with sambal cod fritters. 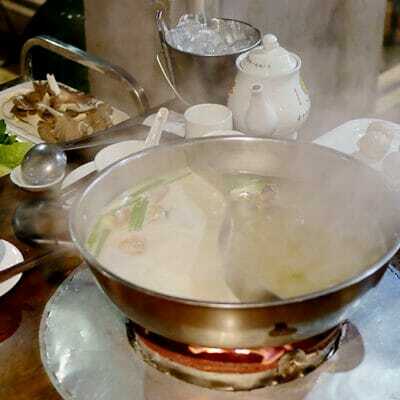 The soup – justly thick and slightly grainy – boasted a mild flavour from the onions. I thought the spicy sambal overpowered the subtlety of the soup. rif however, found it alright. 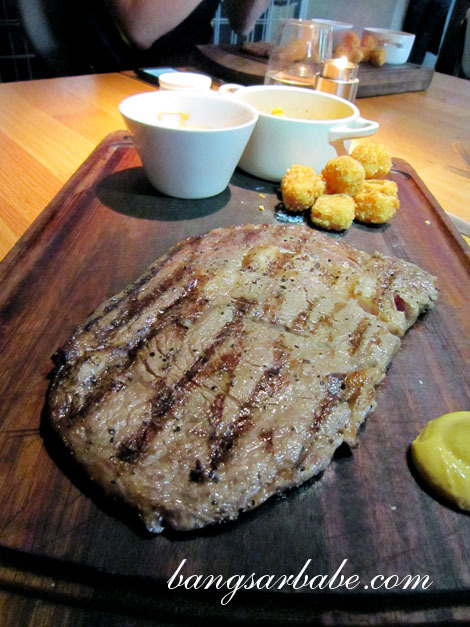 My chargrilled grass-fed ribeye was served on a wooden board – the way I like my steaks served. Instead of the usual baked potato, coleslaw and garden salad, the sides comprised breaded fried sweet potato cubes and sweetcorn with anchovies. My ribeye, cooked to a perfect medium rare, was tasty, as a good piece of meat should be. There was quite a bit of fat on this one and I enjoyed every mouthful. 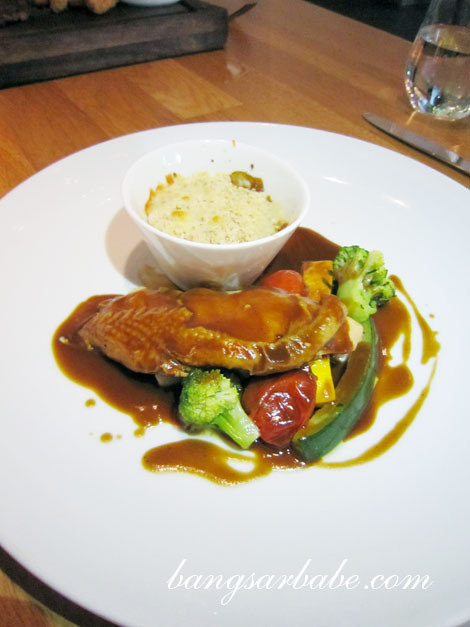 The roasted chicken with oregano, confit chicken and parmesan crumble was rather miniscule compared to the steak. rif and I found the meat slightly on the dry side and the brown gravy rather salty; to the extent of it dominating the overall flavour of the dish. That said, the parmesan crumble was quite tasty. I suspect rif wasn’t at all satisfied with his dish – taste and portion wise. 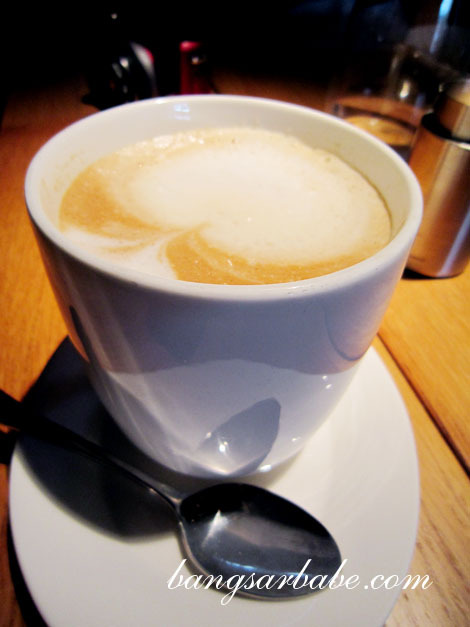 We all opted for the 3-course lunch so we got to enjoy a dessert and coffee/tea. I rather enjoyed my green guava tart tatin with lime ice cream. 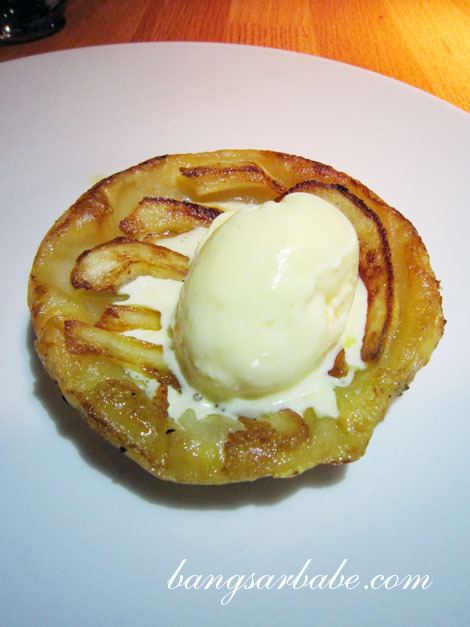 The tart was lightly flaky with caramelized uavaslices, and a rich yet tangy ice cream made me think of summer. 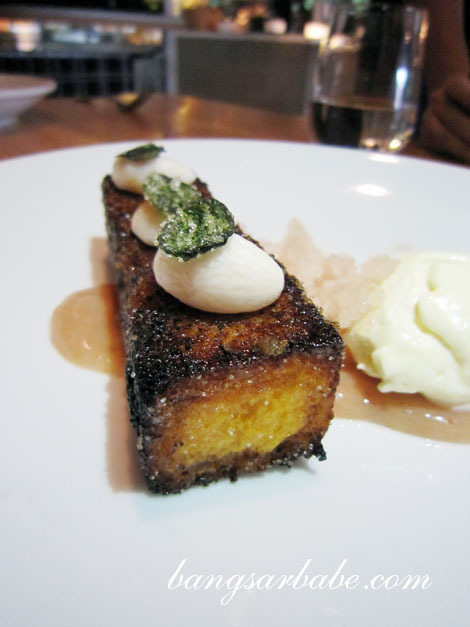 rif’s pain perdu with mangosteen puree and granita was also quite impressive – crusty on the outside and buttery within, it was almost like a double fried French toast, only tastier. But between the two desserts, I preferred mine. Petit four comprised chocolate truffles and fresh marshmallows – the former had a smooth and pleasantly bitter aftertaste. My latte however, wasn’t as pleasant. It was burnt and overly milky. According to rif, his long black suffered the same fate. Service was efficient but lacked warmth. While the food was of good quality, I wasn’t very impressed with my lunch, save for the dessert. It could be that my expectations were set too high or that the kitchen was having a bad day. But don’t let my thoughts deter you from trying the food here – give the lunch set a go and decide for yourself. Who knows…you might enjoy DISH better than I did. Verdict: Decent but quite overhyped food. I love the set lunches here.. really good value for money. The current menu is my fav so far. Yup. You can always count on rif to order funky sounding dishes. Lol! This is on my list to try… I m a big steak fan so I l definately have one like yours! 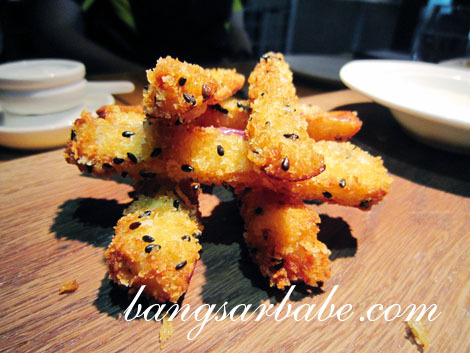 the egg plant fritters looks great.. I use to make this type of breakfast..
Yup, the fritters were addictive! I felt the need to comment on this post, because like you, I wasn’t impressed with the food in Dish either. 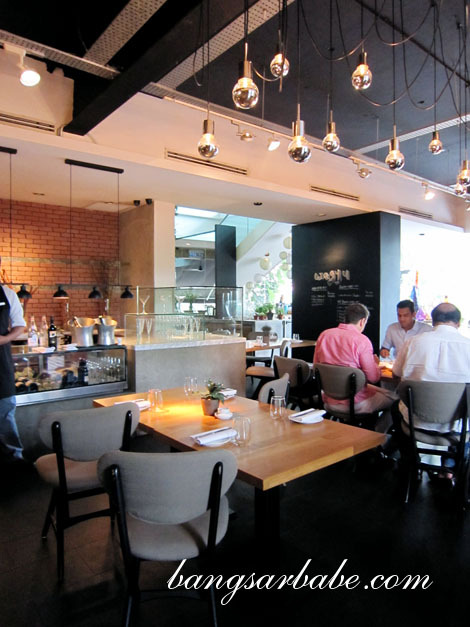 Especially since the menu was supposedly revamped by Gordon Ramsay’s former protege. The worst was the scallop starter. Though it tasted alright, I felt really cheated when they cut 2 scallops into 4 discs to make it seem as though I was getting value for money. And the service was a whole other level of atrocious. My family and I waited 45 minutes for our mains to arrive and there wasn’t even a hint of an apology from the staff. Needless to say we won’t be going back again.